First Democratic Presidential Primary Debate In June, Just 6 Months From Now Democrats will hold 12 presidential primary debates. The Democratic National Committee says it will have about one a month through the process. A worker sweeps the stage prior to the first Democratic presidential debate on April 26, 2007, in Orangeburg, S.C. 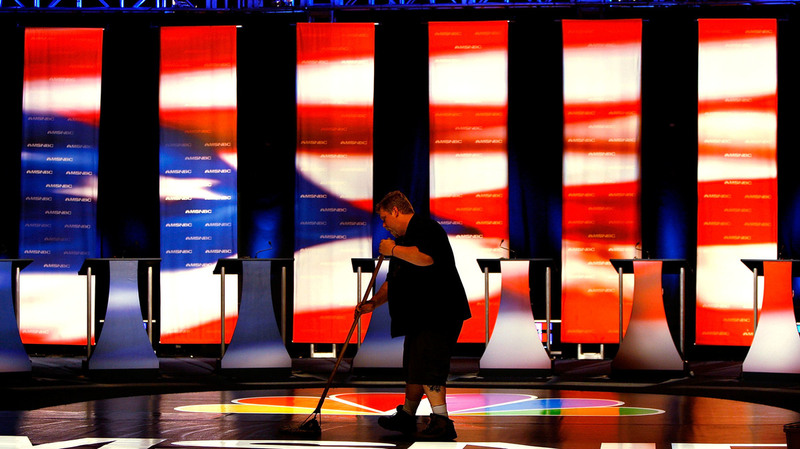 The debate featured eight Democratic presidential candidates. Strap in, the 2020 presidential campaign is about to start in earnest. The Democratic National Committee announced Thursday that it will hold its first sanctioned debate in June 2019. There will be 12 Democratic primary debates, one a month from then on, skipping August 2019. Debate sponsors for the 2020 debates were not announced. Because of a potentially crowded field, the DNC said the first two debates "may occur over multiple consecutive nights." The candidates for each night will be selected at random and in public. "Qualified" candidates will be determined, not just based on polling, but also other factors, including "grassroots fundraising." That's adds up to 10 debates, but the DNC anticipates needing to add two more in 2020. This may seem early, but it's really not. The first primary debates in the 2008 cycle took place in April 2007. There wound up being some 40 debates. The first Republican debate in the 2016 cycle was in August 2015.